Now that Jake is starting kindergarten, I need to be able to come up with a healthy snack for him Monday through Friday from September through June. The thought of this task is quite daunting to me. That is why I have been searching for healthy ready-to-serve snacks to pack for my son that would go well with a juice box or a small bottle of water. These all-natural snacks called Pirate's Booty sounds like it would fit those prerequisites, but how do these healthy snacks taste? 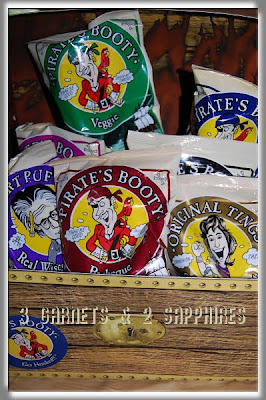 1) I was extremely impressed with the wide variety of snacks and flavors offered by Pirate's Booty! The varieties include rice puffs, corn puffs, and corn sticks. The assortment of flavors are some that I look for regularly in the snack aisle at the supermarket, such as Sea Salt & Vinegar and Barbecue. Also, if you like dip, you will probably like the Veggie Pirate's Booty. That could very well be my favorite flavor. 2) These all-natural snacks are baked and free of gluten and trans fat. They have about 50% less fat compared to the same serving size of the average potato chip. The crunchy corn sticks called Tings are a smart alternative to Cheetos, as are the Smart Puffs to Cheez Doodles. 3) We served the Pirate's Booty to our 2.5yr old twins during family movie time instead of popcorn (which I am always afraid they will choke on). They absolutely loved it! Luke ate his as fast as he could and Makenzie savored hers slowly so they would last her until the end of the movie. I am so happy they liked the rice puffs, because those are easy to eat plus they would dissolve much more quickly than popcorn if they were accidentally swallowed whole. 4) I also like that Pirate's Booty is available in 2 different size bags. The smaller one would be perfect for a single serving for a kindergartner, whereas the larger size would be good for sharing. That is my opinion as a parent, but somehow I get the feeling that Jake disagrees about the sharing of the larger bags . . . This snack has been approved by every member of our family as far as taste goes. I would love to see something similar to a cheddar and sour cream flavor or something hot and spicy added to the Pirate's Booty selection in the future. Currently, you can find Pirate's Booty snacks at most major supermarkets. You can also purchase them by the case through The Pirate's Booty Store. Thank you to Pirate's Booty for providing us with both a review product and a contest prize free of charge. 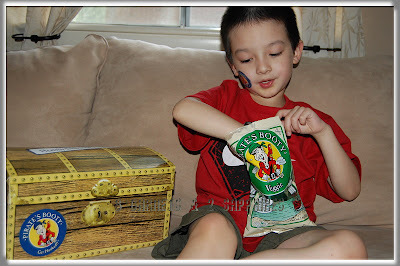 One lucky reader will receive a Treasure Chest filled with 7 varieties of Pirate Booty snacks. Browse the selection of Pirate's Booty snack foods. Then leave a comment telling me which 1 out of the 7 varieties you are most anxious to try. You MUST do this to be eligible to win this contest. 4) For 10 extra entries, blog about this contest linking back to this post AND PiratesBooty.com . Then come back here and leave TEN separate comments with the link to your blog post. This contest will be closed on Monday, September 21st, 2009 at 11:59pm EST. A random number drawing will be held shortly after. The winner will be announced here and will be contact via email or through their blog. If the winner does not respond within 48 hours, a new number will be drawn.